The white grape comes from France, Synonyms are Angelicaut, Angelicaut, Blanc Cadillac, Bouillenc, Bouillenc Muscat, Buillenc, Doucanelle, Douzanelle, Guilan Doux, Guilan Muscat, Guilan Musque, Guilhan Muscat, Guillan, Guillan Musque, Guinlhan Musque, Marseillais, Muscade, Muscadela, Muscadelle de Bordelais, Muscat Fou, Musquette, Raisimotte, Sauvignon à Gros Grains, Sauvignon Muscadelle, Sauvignon Vert, Tokay and Topaque. Despite seemingly indicative synonyms or morphological She may not share similarities with the varieties Muscadelle du Bordelais. 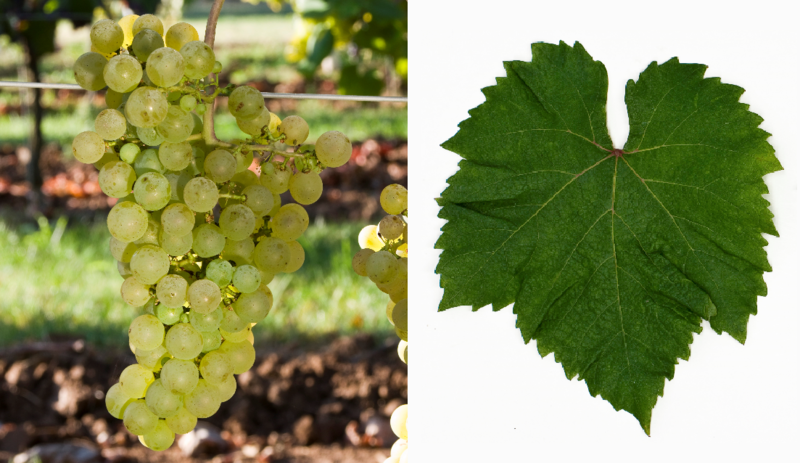 Muscat Blanc or Sauvignonasse (Sauvignon Vert). According to the year 2002 DNA analysis it is one of the many direct descendants of Gouais blanc (Heunisch); the second parent is unknown. The early ripening variety yields fragrant white wines with subtle nutmeg, She is prone to Botrytis, therefore very suitable for sweet wines and part of Sauternes- and Barsac wines. Often she will be with you Sémillon and Sauvignon Blanc blended. In France, the variety is mainly in the fields Bordeaux (especially Entre-deux-Mers), Alsace and Southwest France (especially Bergerac ) and occupies a total of 1,566 hectares of vineyards. In the late 1950s, it had been around 6,300 acres. There are more stocks in Romania (4 ha), in California in the Napa Valley and Australia (67 ha). In Australia, the variety Tokay and the sweet wines made from it were called "Liqueur Tokay", because the origin of the vine in Hungary was wrongly assumed. The name has since been changed to Topaque in an agreement between the EU and Australia on the Hungarian name Tokaj to protect. The variety occupied a total of 1,637 hectares in 2010 with a declining trend. This page was last modified at 15 January 2019 at 08:47.